The town of Witchaven was a settlement that had about three and a half thousand people living in it. That truly was anything and everything the people who passed through this place could say about it. Nestled at the foot of the northern Sawblade Mountains, the only remarkable thing about this remote community was how unremarkable it was. It was self-sufficient, with a stable population that woke up at dawn and went to bed at sunset, had a below-average crime rate and the only thing that could be called a ‘local specialty’ was boredom. Well, that and a secret cult of indeterminate size and reach that used an unholy power to further their own malefic goals, but that was just as unlikely to attract tourists. Yet it was precisely that trait that had earned Witchaven a visit from one very notable individual. Having spent the last four days following the lead it obtained in Azurvale, Boxxy somehow arrived here, in this remote little mountain town. It had infiltrated and gutted two tiny sects of the ‘One Truth’ cult on the way here, but those only had three or four people in them at most. Or at least that was how many were left after most of their congregations had gone off and died in the elven capital. Nevertheless, following up on the clues obtained at both sites pointed to this place as being their origins. Not that the fanatics’ presence was obvious, of course. Even Xera, for all her life experience and ability to read people, failed to see anything out of place. She was currently perched atop the roof of the Witchaven town hall, the tallest building around at only three stories high. Having hidden herself from view with one of her illusions, she had a perfect vantage point to observe the people below. Try as she might, however, her eyes, insight and intuition alike only saw dull people shuffling about in a dull manner as they went about their dull lives on this dull afternoon. The place was so quiet and overwhelmingly boring that the djinn felt like she was about to unlock the ultimate power a sloth demon could have - falling asleep on their feet. She probably would have already done it if not for that nagging feeling coming from next to her. “If you keep staring at me like that, I might start getting the wrong idea,” she said in an exhausted tone. Xera didn’t need to see Drea to feel those numerous bug-eyes glaring at her hard enough to bore through the side of her skull. The stalker was supposed to help her keep watch and look for traces of that peculiar magic the cultists used, but her efforts were just as fruitless as Xera’s. Hence why she had the luxury of giving her co-contractor the octuple stink-eye while under the cover of her Clear Ice Skill. Something she had been doing ever since they left Azurvale. The webstalker was speaking from the perspective of an immortal demon. Which was to say, one who feared boredom more than death. Seeking a way to distract themselves from the soul-crushing tedium brought on by centuries of existence within an immaterial realm was why fulfilling a desire was so important to a demon. Not to mention the main reason any of them agreed to summoning contracts in the first place. Denying a denizen of the Beyond what they sought was therefore one of the best ways to hurt them on a spiritual level. Barring literally soul-crushing cursed weapons, of course. Which was to say that, as someone whose gluttony rivaled or perhaps even surpassed Boxxy’s, Drea felt that banning the creature from the delicious nectar it enjoyed so much was practically a sin. For all of its rapid development, varied experiences, powerful instincts and numerous feats, Boxxy was still only three years old. Though sinister and on a scale most mortals would fail to comprehend, its goals and behaviors were quite childish at their core. It formed habits quite easily, and as demonstrated by that Honeydew debacle, could be incredibly stubborn in correcting them even if it recognized them as harmful. “… Am not,” was Drea’s slightly delayed reply. The djinn’s playful attitude and mischievous smile both sank like a ship being dragged to the ocean floor by a kraken. Being forced to dwell within her master’s personal pocket dimension was not the type of punishment she was a fan of. It was a dark, silent and cramped space that deprived one of most forms of sensory input. The perfect place to lock away an uppity familiar who was obsessed with revelling in the sensations her conjured flesh provided her with. She could theoretically break out of there by force, but the commands that normally accompanied each ‘visit’ made that impossible. “Would you say it’s perhaps too monotonous?” Boxxy wondered. The thought that some kind of mystical compulsion was the source of this unnatural atmosphere of mild contentment did cross Boxxy’s mind, but there was one problem with that. Drea had been meticulously scanning the place from the rooftops since morning. She hadn’t stopped doing so even while arguing with Xera, which was why she felt ratting her colleague out for slacking could not backfire. However, the djinn had wonderfully deflected the accusation while also changing the topic to something more productive, which the webstalker wasn’t going to complain about. Xera scanned the plaza beneath her, easily locating the person in question. She didn’t seem at all out of place to her, though. Definitely wouldn’t have taken notice of her if not for Drea’s words. “… Is it the one that just stopped to fiddle with her belt?” the doppelganger asked. “Oh… Sorry,” Drea said dejectedly. “Why did you think Master’s disguise was worth pointing out?” Xera chimed in. After all, giving off anomalous magical emissions was hardly going to be helpful towards keeping the shapeshifter’s true identity hidden. Even if enlightened beings were born incapable of perceiving such things by themselves, there were ways and means of expanding one’s awareness of the world around them. The Legendary Perception Perk was one such example, but there were plenty of other, more easily attainable options. Certain Skills, magic items, tamed monsters and contracted demons could easily help one detect fluctuations in the ambient mana. Hence why Boxxy was rather peeved to hear that it was still giving off suspicious signals despite its best efforts to hide such things. “… Master, can you have Xera fly me up so I can get an aerial view of the town?” Drea requested after a few silent moments. Boxxy and its two familiars had split up earlier that morning in order to cover more ground while searching Witchaven for any signs of the One Truth cult’s presence. One would think a bunch of gibbering idiots skulking about in dark cloaks and robes would have left some sort of trail behind, but that wasn’t actually the case. There were no dubious rumors, unexplained occurrences, mysterious disappearances or other such telltale signs of a malicious underground organization. It was almost as if the cult wasn’t even here, but the mimic was absolutely convinced otherwise. All the clues it had gathered pointed towards this crappy little town as harboring their origin, the proverbial end of the road. Meaning that, if the location wasn’t the issue, then perhaps the trio’s lack of results was due to them approaching this investigation from literally the wrong angle. Having obtained the necessary permissions, Drea had Xera give her a vertical piggyback ride. Something the djinn struggled to accomplish. While she could float around lazily of her own volition, carrying something as heavy as a person-sized spider-demon required a good bit of effort. It was the first time in a long while that her grunting and panting wasn’t caused by her perversions. They still sounded the same though, which her arachnid passenger found mildly uncomfortable. It wasn’t until ten minutes later when she reached an altitude of about seven hundred meters that her passenger finally told her this was high enough. A webstalker’s magic-sensitive eyesight was an exceptional sense capable of perceiving nuances in an environment’s ambient mana from kilometers away. The closer one got to the thing they were studying, the more details they could make out, such as the ‘flavor’ of the enchantments bestowed upon a piece of gear. Drea’s eyes accomplished this by contrasting an object or a person’s unique mana signature against the background noise of the ambient mana. That was why the cultists that were lurking around Azurvale stood out so much. It was like swimming in a communal pool and coming across a patch of suspiciously warm water. However, what would happen if the pool in that analogy was filled with nothing but warm water? Part of Boxxy wanted to point out that there were plenty of ‘abnormalities’ with Snack, but now wasn’t the best time to argue semantics. This revelation meant that, rather than being a secretive sect run by a small part of the population, the One Truth cult encompassed the entire township of Witchaven. No wonder why none of the citizens it had been subtly questioning said anything - it was because they were all in on it. Whether those people were consciously aware of their allegiance or not was another question entirely, though not one Boxxy was overly concerned with. It mattered not if the enemy numbered thirty or three thousand, any who dared to attack it would be slaughtered down to the last man, woman and child. “The town hall and the local temple of Teresa?” Xera hazarded a guess. Both Boxxy and the ex-succubus knew from personal experience that the best way to gain dominion over a group of humans was to target the ones in charge. Whether it was a household, a town, a province, or even a nation, if one seized control of the head, the rest would soon follow. Granted, the same could be said of any society, but the ambition that drove and motivated humanity to achieve greatness made them significantly more susceptible to corruption than other enlightened. Boxxy wasn’t sure if that was a racial thing or just a cultural quirk, it just knew Imperials were more likely to be swayed by promises of money, power, or both. It was, after all, that very trait that led to Teresa’s thought-poisoning. It therefore seemed logical that this Mistress would have targeted the lord-mayor and the dean of the church. With the governmental and religious leaders in her grasp, it would not be difficult to subtly poison the minds of everyone else. It’s what Boxxy would’ve done if it were to ever try and become a ruler or conqueror. Not that it had such desires, of course, but it did entertain the idea of how it would do it with the least amount of effort involved. The important thing was that it now had two targets of importance to track. Seeing as how the cult it was trying to uncover was of a religious nature, it decided to focus its attention on the church. It rapidly found, killed, absorbed, and then replaced a relatively high-ranking priest. The short-term memories that Broken Reflection was able to pilfer from the mind of Boxxy’s victim were not all that useful, unfortunately. They did help the shapeshifter blend in seamlessly with the rest of the congregation, but did little to reveal anything about this cult. Then again, even if it was disappointing, this outcome was to be expected. According to what Claws had overheard during her one-spider raid several days ago, the Mistress was very careful about information leaks. Considering that she was quite literally inside her minions’ heads, it wouldn’t be far fetched to assume she could either remove or implant memories as needed. The fact that Boxxy still didn’t have a name for her was more than indicative of that. Which was why it intentionally avoided going for the dean directly. The Mistress likely had failsafes and wards surrounding her major pawns, so there was a decent chance she would notice if he had been replaced. The shapeshifter’s current Facade, on the other hand, could both keep tabs on its primary target and investigate the church’s dealings, all without arousing suspicion. Which was precisely what it did for the remainder of the afternoon, though it failed to notice anything out of place before the day ran out and it had to pretend to go to bed. Meanwhile Drea had been sent to track and spy on the lord-mayor, which proved to be just as fruitless. However, though likely not as important to the cult as the dean, the local head of government was doubtlessly involved with them in some capacity. Boxxy didn’t expect to learn much by monitoring his movements and meetings, but it was better to be thorough than not. Xera, on the other hand, was ordered to take over her master’s temporary disguise as Janet, the lonely black-haired adventurer girl from out of town. She was to keep asking questions while spending a few days at a local inn. The shapeshifter had a hunch the cultists would want to do something about the outsider that had been snooping around their town, so it had her act as a decoy. Boxxy’s intuition proved to be right on the money, though it wasn’t until two days later at midnight-ish that the Mistress finally took the bait. A bunch of cloaked townsfolk barged into her room while she was pretending to sleep and held the struggling woman down. They bound her legs and hands with heavy chains while also gagging her with some cloth that had a funny smell to it. They were likely trying to drug her, but the substance was far too weak to affect a demon of Xera’s caliber, so she had to pretend to pass out. Her assailants bought the act so completely they started patting each other on the back for having successfully apprehended a single girl with six burly men. One of the bigger humans grabbed the limp adventurer girl and slung her over his shoulder as if she were a wet carpet. He carried her out of the inn and then down the street with his accomplices in tow. More and more people steadily joined the group as they walked through the deathly silent town, turning what was obviously a crime in progress into a sort of procession. They all had stoic, serious and grave faces with not a single shred of concern or joy, nor did they say anything other than a few hushed and whispered greetings. Yet as the group swelled in size until it reached nearly a hundred members, not one of them seemed to have any doubt or questions as to what they were doing. It was also worth noting that only a fraction of the townspeople were joining in on the dubious midnight carnival. What Boxxy found far more interesting, however, was that they were taking their prisoner outside of the settlement’s gates and into the dark wilderness surrounding it. After about forty minutes of walking, the cultists came to an abrupt stop next to a rather tall cliff. The ground rumbled and quaked softly as the sheer rock face split open like a curtain to reveal a large cave or passage that was nine or ten meters tall at its apex. The numerous torches lining the left and right walls of this hallway burst into bright green flames that bathed the area in light. It was almost as if the mountain itself was inviting the humans to step deep inside it, an offer they did not hesitate to accept. The passage then closed itself back up the instant the last of the cultists had entered the tunnel. Several more minutes of walking later, the procession spilled out into a massive stone cavern. It was a vertical space akin to the insides of a giant chimney or well, though it was clearly not man-made. Its walls consisted of jagged rocks, with bizarre mosses, fungi and plants hanging off of them. Though the large stone platform the passageway led to was well illuminated by yet more green torches, the ceiling - or lack thereof - was obscured by an oppressive darkness. The bottom of it was just as impossible to see, though that was due to the heavy dark green mist that poured out of it. Xera, who was still playing the part of the captured adventurer, couldn’t help but notice it felt familiar. Though the ‘creepy cult’ aesthetic was different, the layout itself was surprisingly similar to that of Boxxy’s home dungeon. Which was to say, a tall and deep vertical space where the only available footing was a bunch of relatively flat platforms that jutted out from the walls. While stealthy peeking out from under her eyelids, she also spotted what appeared to be a slim stone staircase jutting out of the floor of this stone terrace. It was ten meters tall with a podium of some kind at the top that overlooked the mist-filled chasm below. The purpose of this structure became clear when one of the cultists climbed to the top of it, spread his hands out and started yelling at the top of his lungs. The smoke-like mist began to stir and bubble over before it suddenly erupted like a volcano. A mountain of sickeningly green gas rose above the platform, within which one could barely make out the silhouette of a woman. She was clearly not human, however, as the figure’s upper body alone was tall enough to easily dwarf the podium that cultist was standing on. Something that was very easy to notice, given the two eye-shaped crimson lights that peered down upon the humans. The people prostrated themselves immediately, their faces overcome with equal parts awe and fear. The powerful, deep voice swept over the congregation, making them shiver and sweat as the Mistress’s words bore themselves into their skulls. He directed the massive figure’s blood-curdling gaze towards the bound and gagged Xera, who had been tied to a stake and was still pretending to be passed out. Something the Mistress seemed to determine immediately, given the way her eyes twitched angrily the instant they focused on the demoness. The cultists looked on with surprised disgust as what they thought to be a human revealed her true form. A few of them flew into a murderous rage and tried to strike her down, but the djinn dissolved into her Mist Form before their weapons could connect. Not only did this free Xera from her bindings, but it allowed her gaseous shape to blend in with the heavy mist already covering the place. She had, for all intents and purposes, vanished before their very eyes. Both the people and their titanic leader started looking around in a frantic manner, but couldn’t locate the source of those words. The voice echoed all around them, confusing their basic human ears. It was as if it was both everywhere and nowhere at once. The towering woman spotted the glimmer of something falling down from above. However, it was so small that it wasn’t until it was passing right in front of her mist-shrouded face that she was able to see it was a small twelve-sided crystal. The Mistress had no idea this was the product of the combination between Crystallize Magic, Power Overwhelming, and Dark Explosion, something its creator had nicknamed as ‘Big Bang Ball.’ She was nevertheless about to get a very thorough demonstration of what it was capable of. “Said nobody ever,” Boxxy added. A tiny pebble then smacked into the conjured object, coaxing it to unleash its arcane payload. The resulting burst of destructive magic sent the Mistress’s massive upper body crashing into the cavern wall behind her. The blast also dispersed the thick mist surrounding her to reveal that she was neither enlightened nor a demon, but a monster. 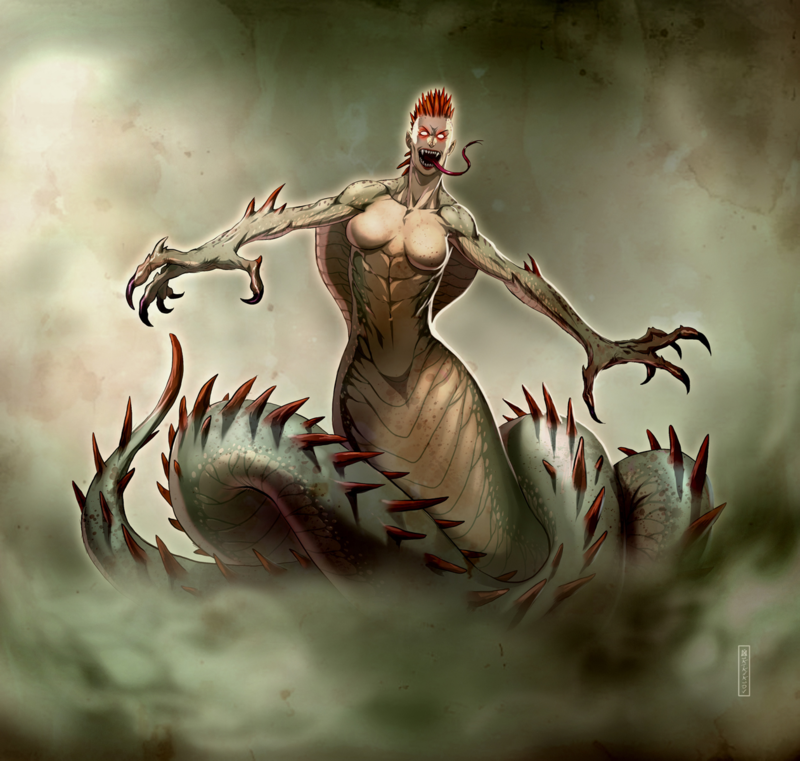 To be more precise, a massive snake-thing with a humanoid upper body and a serpentine lower body, almost like a naga. Yet it was fairly evident she was not one of those, and not just because of her size. To begin with, she had two pointless lumps on her chest that had no place being there on a reptilian monster. Neither was her face, though despite its enlightened-like features it was still ugly enough to fit on a relatively good-looking orc if the orcs had females. Her muscular upper body made the greenskin comparison even more apt. The same could be said of her rough hide and scales, which were green on her sides and back despite being beige at the front. She also had sharp crimson spikes that ran down from the top of her skull down the entire length of her spine, and her large hands were tipped with scythe-like claws. Said ‘servants’ were unable to respond, however, as they had all been slaughtered in the several seconds it took the Mistress to recover from the attack. Boxxy had not only infiltrated their ranks with ease, but it had also hidden six of its Mirror Images among them while they were walking through that suspiciously well-lit passage. And with Drea and Xera here to help their master and its body doubles, ‘several seconds’ was all the time they needed to flatten the fodder. Yet the giant snake-woman seemed mostly unperturbed by the sight of her loyal followers lying in a pool of their combined blood as she took a swing at the group. Her claws failed to damage Xera’s Mist Form while Drea and Boxxy dodged them the old fashioned way, but the body doubles were not as lucky. Though Mirror Images had bodies almost as quick and tough as the original’s, they were nothing more than meat puppets without wills or wits of their own. This made them woefully incapable of dodging sudden attacks like those, so them getting caught up in it was unsurprising. Still, seeing them get cleaved clean through did not fill Boxxy with confidence. It showed that, faulty personality aside, this Mistress’s strength was the real deal. As was her magic, as the human bodies left on that foothold began standing up one after the other, just like the night of the initial attack on the Morgana household. This was something the shapeshifter already expected. The Mistress was, after all, the origin of the ‘Immortality Spell’ wielded by her followers. It would be ludicrous to think the source of that troublesome magic wouldn’t be able to use it. That was fine though, because Boxxy had already come up with a countermeasure after seeing it so many times. Just like the time when she first entered Ambrosia’s tree and encountered the termite infestation, Xera conjured a massive ball of flame and rock that fell through the vertical space. The Mistress dodged out of the way with an aggressive hiss, which was a good thing. After all, her stupidly big body was simply in the way of the Spell’s actual target. Something she realized a bit too late as the meteor smashed into the platform her reanimated followers were still on. The rock buckled under the explosive impact, collapsing it and dropping everyone still on it into the misty depths below. It didn’t matter how unkillable those weaklings were if they couldn’t hit anything. Unfortunately, that was only a minor problem compared to the unknown creature before Boxxy. Having escaped the Meteor’s impact by climbing up the wall, it couldn’t help but question why its Eyes of the Dead God didn’t seem to be working. Or at the very least they were not working correctly, because no matter how hard it pointed them at the Mistress, the result it was getting was… less than promising. It was the first time its pilfered Hero Skill had ever given it such a result. It wasn’t just the incomprehensible gibberish, either, but the fact that there were three lines on display. Usually the top one would be the name, followed by their current and maximum HP level, so what was this last one supposed to be? Either way, it was clearly not dealing with ‘just a big monster,’ nor was this Mistress demonic in her nature. More importantly, the second line of floating gibberish representing the she-beast’s vitality, though illegible, most definitely twitched and shifted every time Boxxy, Xera or Drea attacked her body. This meant that she was definitely taking damage, which in turn signified that she would die like any other monster when it hit zero. Admittedly ‘hit it until it dies’ was not actually much of a plan, but it was the best Boxxy could muster in this situation. It had expected the Mistress to be someone who relied on guile and trickery, yet here she was, swinging those claws of hers with enough force to make its spine tingle every time it dodged them. One option was to retreat and concoct a more devious scheme, but there was no telling if it would get another chance to take her down. 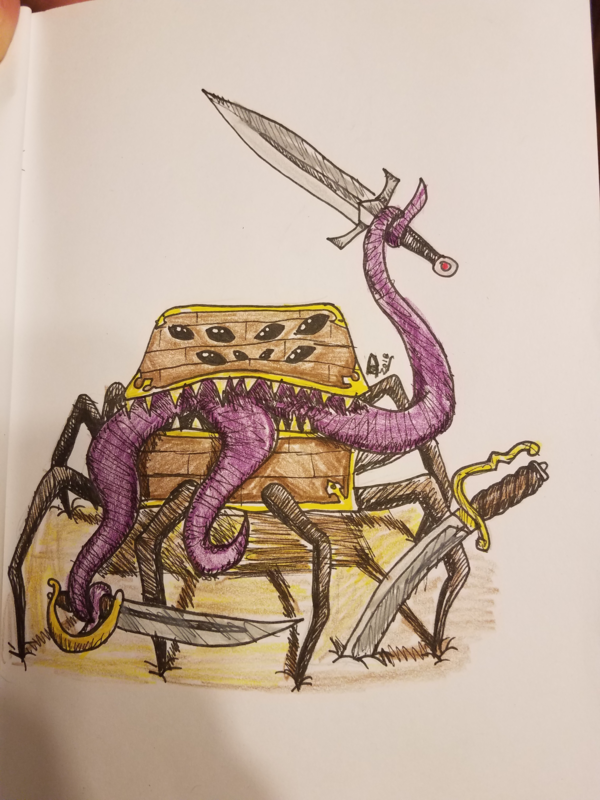 Besides, though it may have been the result of its tainted ego, the mere thought of running away from this thing after everything she put it through didn’t even cross its mind. The arrogant way she acted, the megalomaniacal way she talked, the laughably poor manner in which she fought, all of these felt like an egregious insult. It may have been just a little, but Boxxy now understood how Edward must have felt upon realizing that he had been outsmarted by a box that wasn’t even a year old. Admittedly those massive claws had a lot of destructive power behind them, but that didn’t account for anything if they couldn’t even hit. Between Boxxy and Drea’s speed and Xera’s elusive magic, the only thing this ‘Mistress’ was doing damage on was her own lair. A gigantic wave of magical force emanated from her body, slamming the smaller monster and its pet demons against the sheer rock wall and pinning them there. Neither the doppelganger, the djinn nor the webstalker could break free as their bodies sank into the cracking and crumbling rocks behind them. The torrent of energy was so oppressive that they could hardly even breathe. It was especially bad for Xera, whose body was the weakest of the three, not to mention her Mist Form was useless against a large scale magical attack like this. She leaned forward extended a hand towards it, as if to stab the Sandman-shaped monster in the face with her claw. Boxxy’s eyes went wide when it realized what she was implying, but it managed to keep its demonic side from manifesting itself. This was not a good time to lose one’s cool. The snake woman frowned and opened her mouth as if to say something, but the words got stuck in her throat when she saw something out of the corner of her eye. It was a blur of white and yellow accompanied by a fluttering of feathery wings. She barely had a moment to register the odd sight before a pair of powerful legs kicked her in the side of the neck with a thunderous impact. A bright blue beam of concentrated energy then punched a hole right through her shoulder, followed by something red, black, and angry all over smashing her face in so hard that she now had six fist prints around her eyes and nose. The sudden assault proved to be enough to break whatever hold she had on Boxxy, allowing it and its two familiars to move freely once more. Having considered that something big was about to go down, Boxxy had arrived in full force. It had even brought in the latest addition to its ranks all the way from Velos. It considered bringing Stain along as well, but the slime queen was stretched thin enough already. Frankly speaking keeping the three most blood thirsty members of its retinue out of trouble for three days straight proved more difficult than anything else on this expedition. That said, the opponent that had just revealed herself was likely to put that claim to the test. As for said target, she was understandably less than pleased to find out the interlopers in her lair had grown from three to six. The massive chimney-like cavern then began to shiver and quake like never before. The walls expanded outward, the floor rose up and the ceiling closed itself off as if the mountain was a living thing with a mind of its own. Within moments Boxxy’s group was trapped in a sealed space with no way out and zero places to hide from the Mistress that had made herself their enemy. That thick miasma that had been pouring out of her hidey-hole now flooded the area while the bright green flames of her torches combined themselves into a miniature sun that hung from the ceiling. As impressive as this presentation was, however, ‘despair’ was not the best way to describe what her adversaries did next. Boxxy reached into its Storage and retrieved some high-yield explosives. Xera called out Smokey, her Molten Guardian, and stood ready to display the mystical prowess of a djinn. Kora cracked her fists and assumed a fighting stance that seemed to suggest she was looking forward to more face smashing. Fizzy spooled up her Static Field and readied her new hammer, eager to vent a bit of frustration. Drea warmed up her spinnerets and was hard at work leaving ‘presents’ for the gigantic snake monster to stumble into. Last but not least, Jen sharpened her focus and gathered her ki as she prepared to take her opponent’s head off with the next attack. Indeed, though she proclaimed herself a Goddess and definitely seemed to have power to back that statement up, none of these monsters would just sit down and die peacefully. Nor were any of them entertaining silly ideas like ‘I won’t go down without a fight.’ No, what the doppelganger, djinn, hoarder, dynamo golem, webstalker and griffin-harpy were all gunning for was victory. Regardless of how much power this would-be deity had or whether her wild claim was actually true, there was one major difference between her and the Gods this bunch was already familiar with. Namely the fact that she was not in the Aether or the Beyond, but here on Terrania with the rest of them. And around these parts creatures tended to die when they were killed. Anyone Else Have Thoughts On The Matter~? Nope? If You Read Ahead Somehow It's Not Exactly Polite To Say So And Cut Down A Bit Of Healthy Conversation~! God of creation had a crush on the goddess of justice and got seriously pissed when they found out about the demon dicking and children? but that would mean she is Goroth's spawn? that seems a bit weird. its more likely that she is and dungeon boss and being controlled by a higher power. Or it is a forgotten member of the old pantheon from back when Bob was the god of order and destroyed the world. Could be a survivor of the original gods. You know, the ones phillip god of tightrope walkers supposedly destroyed back when she was a god of order. It'd explain why she calls him the enemy. Or nemesis, or whatever. Old god, that's my theory. but how would that essense have gotten out of the beyond? we saw that it simply forms into demons, and even so there are some clear hints about this somehow having similairities with a dungeon. maybe a dungeon core of teresa somehow got corrupted and that's what this creature is? it would explain the immense magical powers and the near perfect mind control. sorry what, I don't follow your sentence. no same planet, but instead of making sure that everything was perfect order he went choas, which means doing everything he can in order to create life. Nope, Terrania is a different planet than the one Muffinman turned to a lifeless rock. Is it now? Well, maybe she is an alien God. Yes but look at Sun God, he can not even have his own Divine Space and uses other Gods space, what would happen if he were to lose all his followers? Maybe it already happened in this NEW world? Just because it is a new world doesnt mean there are no fallen gods. I remember that God of war hates monsters as at the beginning the Enlightent ones were too weak, maybe there were so that worshipped Destruction but as the Enlightened ones got stronger they stopped worshipping? My guess would be she's one of those "Fallen Gods" mentioned during Teresa's detox scene, like what Teresa herself would have become if the greed and malice of her followers had been allowed to corrupt her fully. I supposed it would only be prudent for Montgomery to boot any such fallen down to the mortal plane, where hopefully something might come around and kill them eventually. Also, I imagine that "While stealthy peeking out from under her eyelids" was supposed to be "while stealthily"
In the last sentence, should there be a comma? I don't know about the comma, but is that a reference to Emiya Shirou?